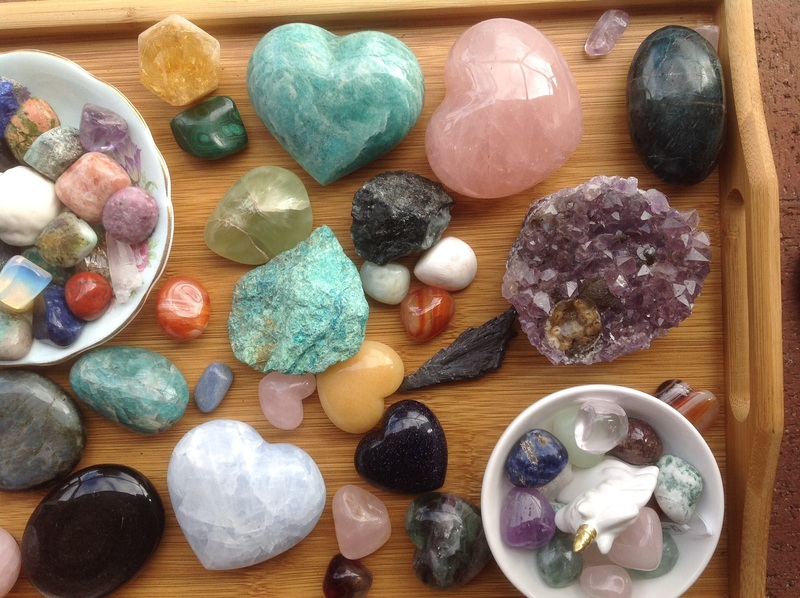 Need I say that I love crystals! 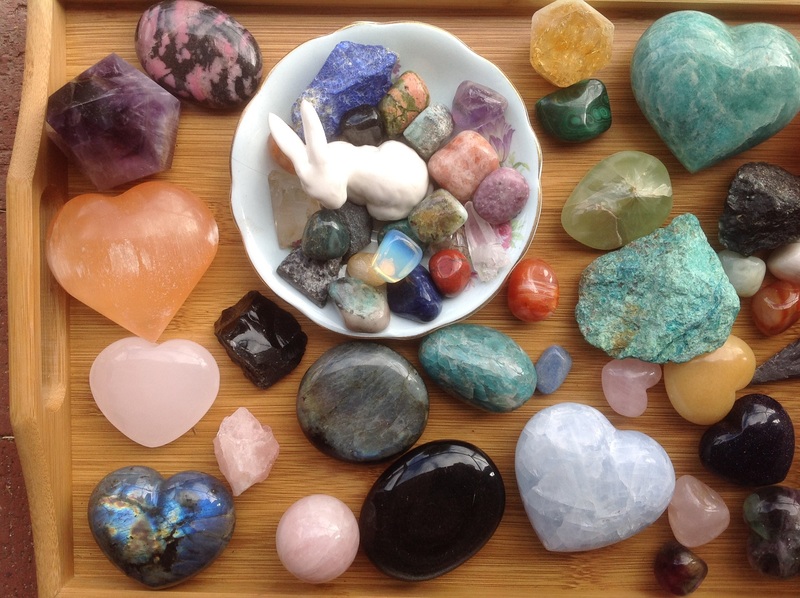 The crystals include rose quartz hearts, orange selenite heart, labradorite heart, aventurine and blue calcite hearts, amethyst cluster, black kyanite, amazonite, black obsidian and lots of gorgeous tumbled stones which I like to place in trinket trays. My crystal “friends” bring me alot of calm and comfort and beauty, and while I’m not attached to them, particular crystals will seek me out, for what I need in the moment. Crystals have a crystalline structure with certain atomic configurations and energy frequencies which can interact with the subtle energy fields of living beings. 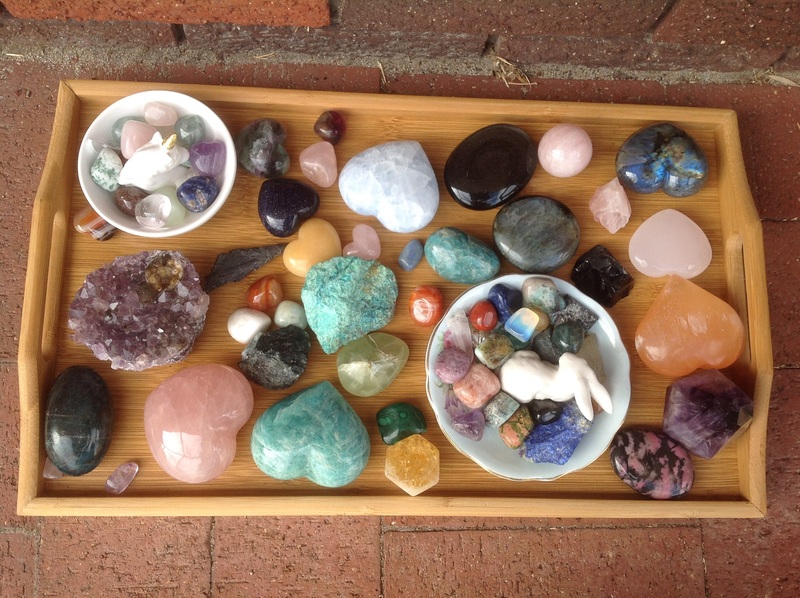 I love crystals. I find the following books useful for me. Ethan Lazzerini has a fantastic website about Crystals. Head over now to his site, in order to learn a huge lot about the beautiful and magnificent crystalline world that we are parts of. Click on the link below. 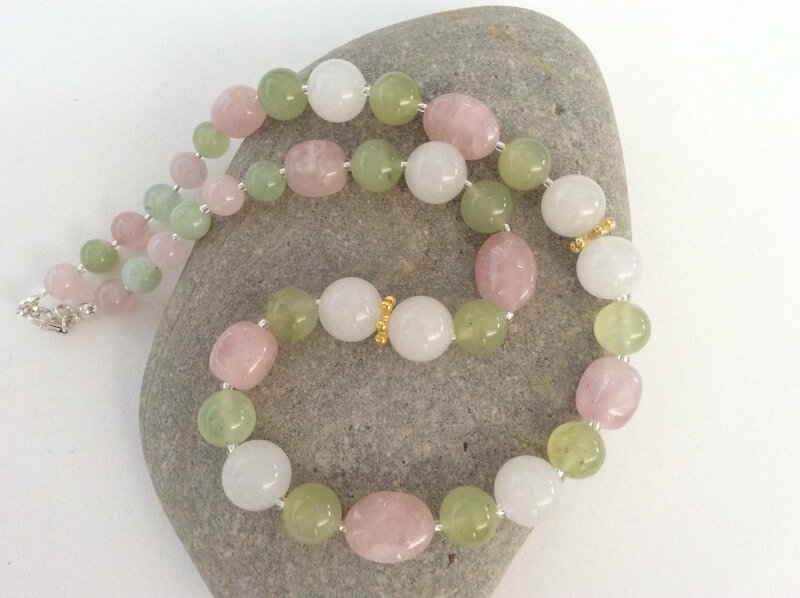 Categories: Beauty, crystals, Gemstones, Peace, Personal | Tags: beauty, crystals, full moon, gemstones, peace, spiritual | Permalink. Today my treasures, 3 of them and more, arrived from an amazing craftswoman, June, based in Ohio USA. I am thrilled with my large heart shaped pendant, filled with real tiny sea-shells and star-fish, and with my deer ring – so cute and sweet and cheery against a vivid blue and snowy background scene. You can see from June’s Etsy store, link above, that her imaginative and highly beautiful and creative jewellery is creating quite a “storm” e.g. Miley Cyrus wears an ** i-sew-cute ** large sparkling red heart shaped ring. My own interest in these treasures began a while ago when I bought 2 of June’s heart shaped Unicorn pendants. I gifted these to my 2 young nieces, whom love them. Well, this ocean themed pendant and the dear ring are mine! Even though I have got small hands, I actually wear large “statement” type rings, and I LOVE bling, and I love my 2 new pieces of jewellery, thank you to June. In the photo I’m wearing what I call my “Kylie” glasses – they are my reading glasses (and I call them my Kylie glasses because they look somewhat like something I thought Kylie Minogue would wear, LOL) …. and you can see just how large the sparkly pendant is too – at 2.5 inches x 2 inches. The pendant and ring are made from eco-friendly resin and glitter, and the ring band is quite adjustable. Lately I have been feeling quite depressed at work because although I am a nice person and do my utmost in my workplace to include and support all others, I have moved to an expanded work team at a new location within the CBD / city – – – and not feeling understood / acknowledged / appreciated or genuinely supported – even to the extent that women in my own immediate team whom I have shown the aforementioned to – – were lashing out at me. Too many harsh things one after the other – so RETREAT ….. I couldn’t face them again so I took the day off work. No, I do not bury my head in the sand and avoid resolutions, or get unnecessarily angry with anyone. I always try to make sense of things and try to improve my own-self in terms of my relationships with others and getting what I truly want – which is the aforementioned. Sometimes this takes a huge effort ….. and you know what ?? You can expect nice surprises from Life, as well as not so pleasant unexpected things, I have learned. With my jewellery, June also kindly sent me a gorgeous rainbow Cat-Unicorn !! Here she is. I gave a cry of delight when I saw this card and exclaimed “Oh, that is sewwwww cute”. It is and it has warmed my Heart. This sweet colourful surprise has helped heal me today, as has my heart pendant and animal themed dome shaped ring. So, as you travel through Life, keep your heart open for rewards and nice surprises. Make sure you read all of June’s “Announcements” and her “About” page. June is not only a gifted artisan but an inspiration to me, and I wish June and her family well. Now, my rainbow Unicorn cat, my deer friend & my Star-fish and Sea-shells are all going to have a rendezvous with me, and we will relax, surf the waves (so to speak) and be happy. Categories: Animals, Art, Beauty, Crafts, Nature, Peace, Reviews, Spiritual | Tags: beach, crafts, jewelery, necklace, ring | Permalink. Friday 9 June at 9.09 PM here in Perth, Western Australia, was the zenith of the “Strawberry mini Full Moon so I thought it fitting for me to share my strawberry quartz Meli Moli perfume gem bottle. I was so lucky this year to find this beauty on-line at half price, so of course I had to break into my savings, to purchase this rare Strawberry quartz perfume bottle. Quartz with red inclusions of iron oxide is rare, and is often sold under the name strawberry quartz or red fire quartz. Strawberry Quartz carries all the vibrations of Clear Quartz, with the additional attributes of universal love, understanding of purpose, and seizing the day. Carrying Strawberry Quartz can be soothing and calming for someone who works in a fast-paced environment. I can report that holding my beautiful Strawberry Quartz perfume bottle certainly makes me feel calm & loving. The Chinese based Meli Moli company has worked with German designer Mr Bernd Wolf to produce their exquisite gemstone perfume bottles. Anthony Mong used to carve from ivory, and now carves these bottles for the Arts King Company. At the time of posting this, there is a medium sized Tiger Iron gemstone perfume bottle on sale on eBay – click HERE if you are interested. It may only be available to Australian buyers. Categories: Beauty, Fashion, Gemstones, Perfume | Tags: arts king company, crystals, meli moli, perfume, strawberry quartz | Permalink. 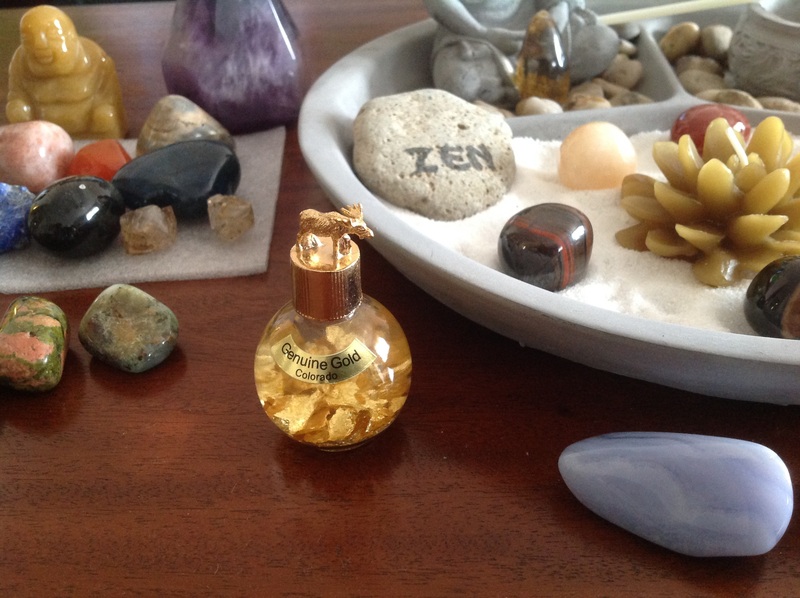 I placed the gold flakes in the bottle (being watched over by the Moose) next to my lovely crystals and my new “Zen Garden Crystal set”. 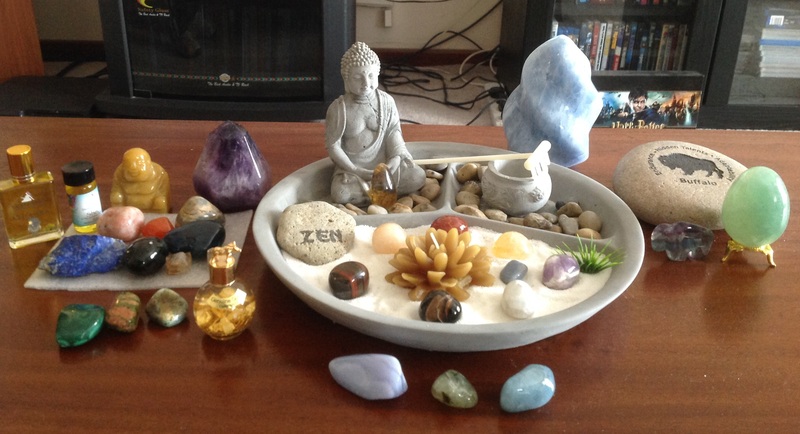 The Zen Garden tumbled stones are for “success & abundance” and I was seeking a little bottle of gold to put near it, then I found an item – which would be PERFECT. It really is a thrill for me to now have this gold bottle because lately I’ve been watching the Documentary series “Prospectors” and love watching the teams prospect by hand for topaz, aquamarine and other crystals in beautiful Colorado. Also I watch “Klondike Gold” where the teams go to unbelievable heights to get gold. The gold in this bottle glows. It is real gold and it’s a good sign to have what you would like more of with your crystals or Meditation objects, and to keep them clear / clean of course, and thus “charged, and to infuse them with your positive intents. Furthermore, my “inner Animal Totem or Guide” is the BUFFALO – see my other Blog here . Now I know that a Buffalo is NOT a Moose, and a Moose is not a Buffalo, however I love Moose or Elk and I respect all animals. I hope that Moose, in their natural habitats, will be able to stay away from troublesome humans and flourish. Head over to Rick’s eBay Store for a really interesting bargain, if you want, and you won’t be disappointed. 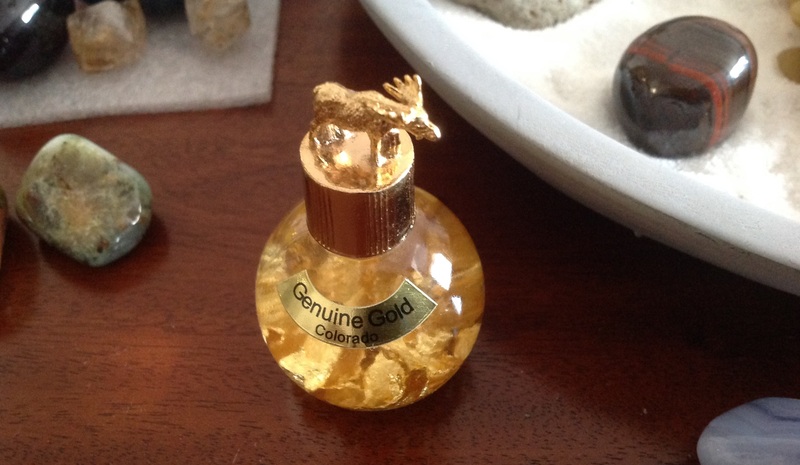 I am carrying around my bottle of gold today – so moving it from my Study to the Lounge room to the Kitchen to Dining area – because it makes me feel like a million dollars – and the Moose totem makes me feel comfortable. It “warms the cockles” to be surprised with the thoughtfulness and generosity of a welcome free Gift. We are all in this one Earth together Folks, let’s appreciate & respect the Earth’s resources, learn from each other, and be nice to each other … altogether in our Lovely World. Categories: Animals, Beauty, Gemstones, Nature, Peace, Spiritual, Symbols | Tags: colorado, crystals, gold, gold bottle, moose, Zen | Permalink. 12 mm faceted Black Onyx rondelles, rose gold beaten beads and a 12 mm lustrous cultured pearl – 21 inches length. Black Onyx is said to bestow self control, decision making, intuition and protection. It is a powerful protection stone as it absorbs negative energy of people to release mental stress and promote emotional well-being. Black Onyx is associated with the planet Saturn, and will bring a positive vibe for those born in the shadow of the planet Saturn. It is said to be a stone for the Leo zodiac sign. Well I am a quadruple Virgo but I have the Moon in Leo when I was born! Black Onyx is very easily scratched if not handled with care even easier to clean the stone by using the commercial jewelry polish. Once polished, the piece should be washed with hot water and dried with a soft cloth. A drop of olive oil can produce beautiful light of the stone. Rinse water can also clean the dirt but do not ever soak the stone because it can fade the color. Avoid two stones together to avoid friction. Suggested to avoid the heat, light or excessive chemicals to extend durability of the stone. I am selling this necklace because I have so many necklaces & brooches, I really need to down-size. This beauty although gorgeous and energizing is not suitable for every-day wear for me, as I work in records management ( often in casual wear, packing & moving around boxes ) and I don’t go out alot to functions or places where I would wear this. Even if I did, I have many other necklaces which I would rather wear. 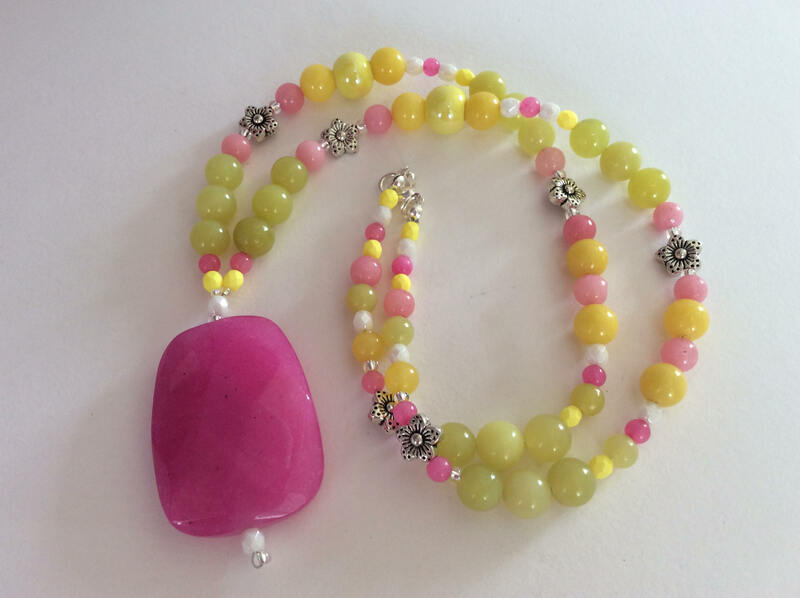 IF YOU DON’T LIVE IN AUSTRALIA, and would like to purchase this Necklace, please use the Contact form if you can purchase this for $100 AUD ( I bought it for over $100 AUD and it will cost you less in USD ) plus postage. Australian buyers can go to eBay Australia. Categories: Beauty, Jewellery, Personal | Tags: beads, black onyx, crystals, jewelery, necklace | Permalink.